New Release: How do I add a table to my Additional Form? 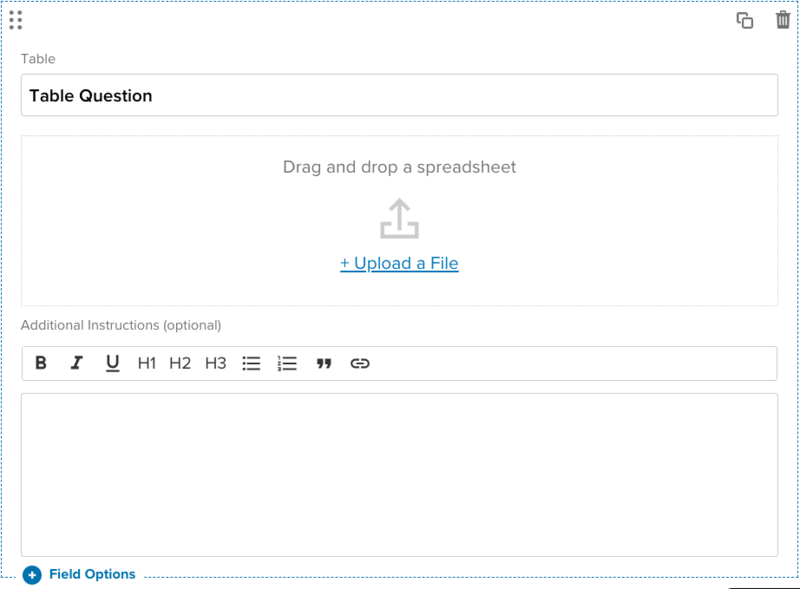 Add a responsive spreadsheet to your form or additional form. The Tables feature enables organizations to include fillable tables in their application form. Organizations can upload a spreadsheet template into their application form, including common spreadsheet formulas such as SUM or COUNT. This creates a table in which applicants can enter data. As the applicants enter data, the table will automatically make calculations based on any formulas in the spreadsheet template. From the Form Designer on the left, drag and drop the Table field from the toolbox onto your application form. 2. Give your table a name, such as Project Budget. Determine if your table will be a requirement for your applicants in the Field Options area and select the "Response Required" checkbox if so. Here you can also designate if there is any applicable blind review setting. 3. To create a spreadsheet template on a PC, you can use Microsoft Excel or Google Sheets. 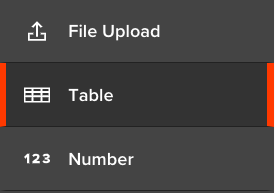 locate your Table field and click Upload a file, or drag and drop your .xlsx file onto the form field. (Note: If you’re creating the spreadsheet in Google Sheets, click on File > Download As > Microsoft Excel (.xlsx) to download a .xlsx version of your file.) If at any time you’d like to switch this file for another, click Remove file and upload another .xlsx file. Click Done when you’re finished. 7. To see what your table looks like to an applicant, click the View Your Site button at the top right of any page in your Submittable account and select the appropriate form. Locate the table on your application form. As the applicant fills in your table, any formulas you entered into your spreadsheet template will automatically generate calculations. 8. To see an expanded view of the Table, click Expand. To go back to the application form, click Close. 9. After the applicant has submitted the form, you can view the applicant’s table data by downloading the completed table from the submission. Interested in adding Tables to your organization's account? Contact us at sales@submittable.com.